Caddy Spoons – an Illustrated Guide, by John Norie, is heavily drawn on for this article. This is the classic period of caddy spoon design. Early spoons were often based on the scallop shells, which John Norie and others believed them to have been included in chests of tea, and used as measuring scoops when sampling the tea. Some natural shells were silver mounted, and various materials were used to produce early ‘caddy ladles’ throughout the Georgian period: Norie mentions ‘tortoiseshell, treen, mother of pearl, ivory, bone, horn and ceramic ware’. And of course, Old Sheffield Plate (OSP) spoons can still be found, though genuine examples are extremely rare, and can be difficult to authenticate let alone date. They often, though not always, replicated the original silver designs, usually of the Sheffield makers, but sometimes from further afield. Dates can always be disputed, but any English short-stemmed silver caddy spoon hallmarked earlier than 1780 is a rare item indeed and should be looked at very carefully before accepting it as genuine. 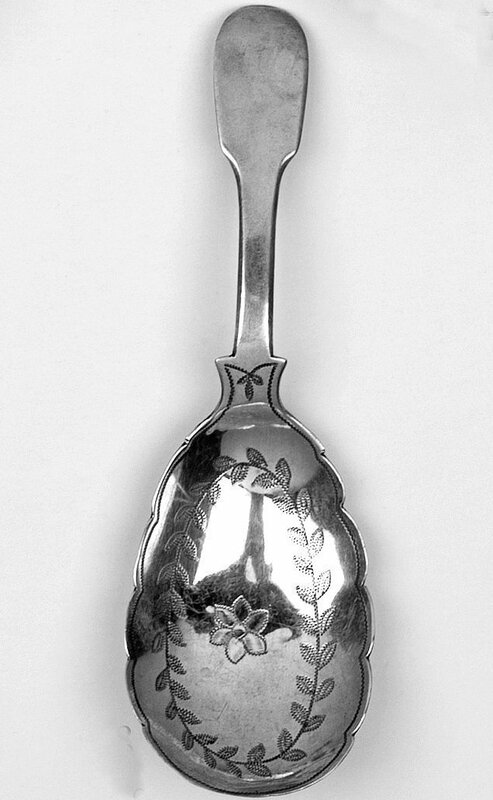 Before that date, silver items were hand-raised; it is fair to say that after the development of the new techniques, including the use of Benjamin Huntsman’s steel die, many Georgian and Victorian silver spoons were die-stamped from sheet silver, especially those produced or assayed in Sheffield and Birmingham. It is at least arguable that the development of die-stamping made possible the production of much cheaper silver items, so bringing the caddy spoon (along with other ‘toys’ as small silver items were known) into popularity with the emerging middle classes. Initially, shell designs predominated although some London makers were very soon producing leaf-shaped bowls, plain round bowls with more or less decorative handles, and shovel scoops, often with bone, horn or mother of pearl handles. More elaborate designs soon started to appear, incorporating flowers & foliage, birds and even ladies’ crinoline gowns. One of the most famous of the ‘novelty’ spoons produced from this period is the Jockey Cap. This design was very popular, and several makers produced them in London, Sheffield and Birmingham from around 1800. Some filigree silver Jockey Cap examples are known, but this was not a very robust form for an everyday object, so there are relatively few survivors. Old Sheffield Plate was popular, at a time when silver was expensive and labour relatively cheap. One of the plates in Norie shows a Jockey Cap marked for Samuel Pemberton, Birmingham c 1800 alongside a very similar OSP example. Other novelty designs include the Acorn, possibly initiated as a caddy spoon by Samuel Pemberton (although the design appeared much earlier in teaspoon bowls for example) and also produced by several of the other great makers of the time including Elisabeth Morley; the Hand, mostly associated with London maker Josiah Snatt and to a lesser extent with Birmingham maker Joseph Taylor; and of course, the Eagle’s Wing of Joseph Willmore of Birmingham. Other makers also produced examples, perhaps most famously Matthew Linwood and in the later Victorian period George Unite. Willmore’s Eagle’s Wing is the emblem of the Society and is described elsewhere on this website. This necessarily brief introduction is, we hope, just the first of a series of articles to be published on our website. Please visit the site regularly – you never know what you might find! If you share our interests and objectives, the SCSC will welcome you as a member.